Paper Order Form vs. Online store: What’s right for me? You’ve been put in charge of gathering orders from individuals within your organization, but what now? We will work with you to make this daunting task a manageable one. Getting these off of the ground can seem intimidating, but with our help it can be done in less steps than you may think. One thing rings true whether an order form or an online store is right for you: 8-12 items is the sweet spot when choosing what to offer for people to buy. If you are a business and you will have 75 or more people ordering, an online store can provide an easy way for each person to access the store. An online store will allow them to choose the product that is best for them, while seeing an individualized sizing chart for each item. Are you the lucky one chosen to set up a clothing sale for a large school or an entire school district? An online store would be a great option for you to choose. An online store will eliminate the hassle (and worry) of collecting hundreds of pieces of paper and checks. For a sports team that has the potential to reach 75 people or more, an online store would be a great opportunity. Picture this: You send the link out to all the football parents and players, and you don’t have to do anything else until the clothing and items are screen printed and ready to be picked up. Pinch yourself. You are not dreaming! College sports teams have parents, relatives, and alumni all at their disposal. This can mean selling to people all over the country with ease, and having it shipped directly to them. With some advertising for your store, this can be a successful way to delight parents and alumni everywhere. Does one of these describe you? An order form is the way to go. You are a smaller business, but you still want to have an offering of screen printed and embroidered products for your incredible employees. Say no more. An order form is the thing for you! A small high school sport or activity. The kids involved with your softball team are awesome, and they want to order spiritwear to show that team spirit. You are on the right track with us! 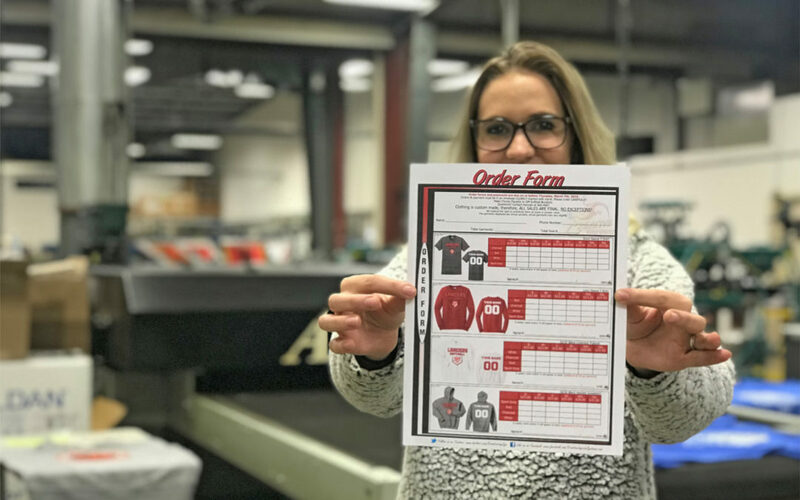 We can design your order form and even print them out for you to pick up at one of our three locations. Maybe your school hasn’t had a great spiritwear order rate in the past but you are ready to try again. An order form can be a great fundraiser for you!